This revision includes one-click icons for the NinjaTrader Version 8.0.15.1 new drawing tools Time Cycles, Polygon, and Order Flow Volume Profile. Note: The Volume Profile drawing tool icon works only with the NT lifetime license. Revised to include all of the NT8 drawing tools and more. The drawing objects and markers are programmed to show a limited toolbar set as before to prevent cluttering of the toolbar. However, If desired, one can check or un-check the items on the properties drop down menu to show all or whatever drawing tools of interest. 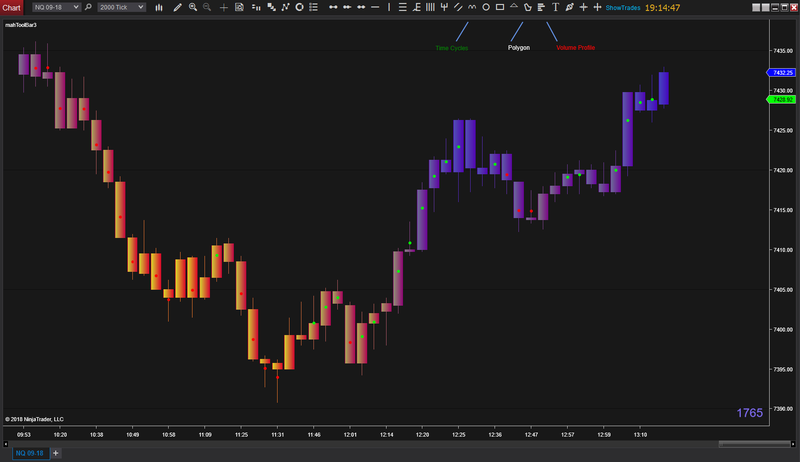 The mahToolBar indicator is a selection of drawing object icons for a one-click drawing and installs in the NinjaTrader Main Toolbar to save chart space. This is a compilation of ideas and scripts from several people on this forum Including ChelseaB and Jessie - Thank you all. I have included my favorites objects. Individual draw objects are selectable and the user can choose any or all objects to include in the toolbar. One can certainly add, with minimal effort, as many objects from the draw object dictionary as one wishes.